The regional city of Orange is located approximately 260km west of Sydney in the Central West of NSW. Water supply in Orange was provided by two water storages which captured runoff from predominately rural catchments. By late 2007 the city’s water storages were below 40% and significant resources were directed to reduce water consumption. The Blackmans Swamp Creek and Ploughmans Creek stormwater harvesting schemes are capable of providing an average of 1,350ML/year of additional water into the Orange’s raw water supply each year. This results in up to 25% of the city’s water needs being supplied stormwater collected from the urban area. Orange City Council is responsible for water supply, wastewater management and stormwater management in the area. Council’s role extends from planning and designing capital works, construction and maintenance of on-ground assets, to engagement with the community (e.g. demand management). Geolyse are a local multi-disciplinary consultancy firm who have worked closely with Council since 2007 to deliver secure and sustainable water supplies for Orange. Department of Industry Water is responsible for the management of the surface water and groundwater resources across NSW. Approval is required from Department of Industry Water for harvesting water from waterways. NSW Health provided advice on water quality risk management. 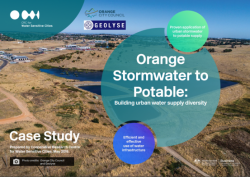 Up to 25% of drinking water in Orange can be supplied by stormwater harvested from the urban areas.